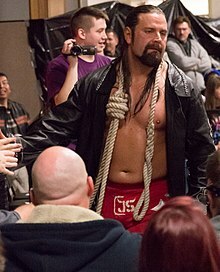 ↑ 2.0 2.1 2.2 2.3 2.4 "James Storm bio". Online World of Wrestling. สืบค้นเมื่อ 2008-08-10. ↑ 3.0 3.1 "Wedding: James Cox and Dani McEntee". Tcpalm.com. 2011-05-12. สืบค้นเมื่อ 2011-05-12. ↑ 4.0 4.1 "James Storm profile". Cagematch. สืบค้นเมื่อ 2010-11-13. ↑ 5.0 5.1 5.2 5.3 "James Storm profile". Total Nonstop Action Wrestling. สืบค้นเมื่อ 2008-08-10. ↑ 6.0 6.1 Goodman, Larry (2010-11-13). "TNA house show report 11-12 Nashville". Wrestling Observer Newsletter. สืบค้นเมื่อ 2010-11-13. Storm talked about starting out at the Fairgrounds training under Wolfie D and Jerry Jarrett. ↑ Westcott, Brian. "Cyberspace Wrestling Federation/NWA Cyberspace Tag Team Title History". Solie. สืบค้นเมื่อ 2008-06-24. ↑ "The PWI Awards". Pro Wrestling Illustrated. 33 (3): 82–83. 2012. ↑ Meltzer, Dave (2011-10-18). "TNA changes title today at TV". Wrestling Observer Newsletter. สืบค้นเมื่อ 2011-10-18. ↑ Caldwell, James (2011-10-20). "Caldwell's TNA Impact Wrestling report 10/20: Complete "virtual-time" coverage Bound for Glory fall-out, TNA World Title match". Pro Wrestling Torch. สืบค้นเมื่อ 2011-10-21. ↑ Duncan, Royal. "NWA National Wrestling Alliance NWA World Tag Team Titles History". Solie. สืบค้นเมื่อ 2008-08-10. ↑ Caldwell, James (2009-05-24). "CALDWELL'S TNA SACRIFICE PPV REPORT 5/24: Ongoing "virtual time" coverage of Sting vs. Foley vs. Jarrett vs. Angle". PWTorch. สืบค้นเมื่อ 2009-10-26. ↑ Wilkenfeld, Daniel (2010-06-24). "Wilkenfeld's TNA Impact report 6/24: Ongoing "virtual time" coverage of Spike TV broadcast". Pro Wrestling Torch. สืบค้นเมื่อ 2010-06-25. ↑ 16.0 16.1 Martin, Adam (2005-11-28). "TNA announces plans for 2005 Year-End Awards after Turning Point PPV". WrestleView. สืบค้นเมื่อ 2011-07-15. ↑ "WWC World Tag Team Championships". Wrestling-Titles.comt. สืบค้นเมื่อ 2006-03-25. หน้านี้แก้ไขล่าสุดเมื่อวันที่ 18 สิงหาคม 2560 เวลา 23:11 น.